In this video tutorial, you use components from Flat UI Pro and the steps from the previous videos in the Flat UI Tutorial series to use LESS to create simple forms, including sign-ins with a social network or email. 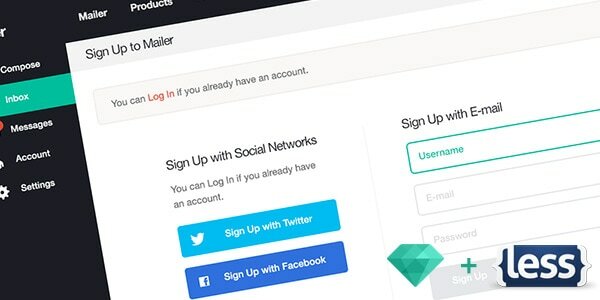 The simple forms allows you to create a custom sign-in form using the flat design style with components of Flat UI. You will use LESS and HTML to create the form, creating a custom title bar, alert message, and different sign-up/log in options. The tutorial takes you through steps to build the form and customize it with different color and CSS options. The tutorial is easy to follow if you have basic web design and coding knowledge. What you will learn in this tutorial: How to use LESS styles and HTML to create a simple sign-up form.